Action In or After Credits Yes, During last episode close credits. 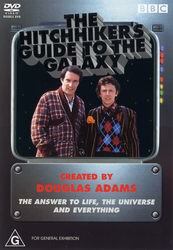 ����The release of The Hitchhiker's Guide To The Galaxy to DVD has been, to put it mildly, anticipated for a long time by fans (or at least, my close circle of friends who are all fans) � and when it was offered for review here at Michael D�s, I can tell you there was a lot of teeth-gnashing, arm-waving and generally abusive and offensive language from all those keen to get their hands on it before everyone else. To put it another way, if fighting-to-the-death was an effective way of securing a title for review, there would have been many open vacancies at this site. ����Why is this title so important? It is fair to say that Hitchhiker's was a seminal concept back in 1977, beginning as a radio show on BBC Radio 4 and written to perfection by a frightfully young and extremely cash-strapped 25 year old named Douglas Adams. The radio sessions (available on CD) are quite extraordinarily impressive, both literally and technically and are a treat to hear. They relate the story of Arthur Dent, an ordinary man who, clutched to safety by his weird friend from Betelgeuse just before the Earth is destroyed to make way for a hyperspace bypass, is deigned to explore the universe in his pyjamas, with only the odd cup of tea for comfort. ����Subsequently turned into a running series of five novels (the first three of which should be required reading), a couple of vinyl LPs, the odd stage production and of course the six-part BBC television series - Hitchhiker's will forever be remembered as the hallmark of Douglas Adams� style of writing, humour and uncannily endless well of unique perceptions of life-kind. It has and will continue to inspire like-minded authors (Red Dwarf�s double-entity of Grant-Naylor spring to mind) until we all end up drinking Pan-Galactic Gargle Blasters at Milliways � the Restaurant at the End of the Universe. ����As for me, Hitchhiker's was an integral component of my youth, something which sat so well with my way of thinking and sense of humour, and rang with such truth amidst its own controlled chaos that I cannot recommend strongly enough to anyone to get this DVD, get the books, listen to the radio shows and anything they can get their hands on. I am sure the late Douglas Adams would have been most pleased with this DVD, in itself a multimedia extravaganza undreamt of back in 1981 but now an unnervingly apt way to explore the series and the production of it in detail. ����Having seen this series countless times on TV and VHS, I was not expecting a great deal from a 20-year old series made for TV on a limited budget. What we have is what could be expected � a faithful transfer which is as good as I have ever seen it. ����The episodes are presented in the native aspect ratio of 1.33:1 and are not 16x9 enhanced. ����Sharpness is somewhat variable throughout the episodes, being soft on the whole but certainly very good all things considered. The aspect which struck me the most was the lack of noise in the image. In fact, from the opening scene of episode one I was very pleased with the lack of noise, drop-outs, wobbling, mis-tracking and any number of VHS symptoms I have been so used to for so long. It�s quite a delight to know that the image, as good as it is, will never degrade with the doubtless multiple viewings it will get over the coming years. Shadow detail was also far better then I have seen it, again due to the lack of noise. Grain is apparent, but it is not problematic. ����As with all TV productions from this era, colours are recessed and a bit dull. The animations come across superbly, and are perhaps the best examples of good colour reproduction. It�s great to be able to pause and read the small text on the book display � makes for quite funny reading considering it was only ever going to be on the screen for a small time, another testament to the high production and artistic values present. Overlaid colour text reveals composite artefacts at those times. ����There were no MPEG artefacts noticed at all. There were the occasional tape tracking errors and film artefacts but these were rare. Also of interest was a small amount of microphony-like distortion in the early parts of the first episode, which did not make a return for the rest of the show. Pleasingly, there was no edge-enhancement. ����Subtitles were okay, skipping the odd word but getting most across well. ����Now here is a real treat. We have the choice of the original mono soundtrack, or a swanky stereo remix. Both are presented in Dolby Digital 2.0, the latter being surround encoded. ����Dialogue is exceptional in its clarity and fidelity, always in sync, and often having a wonderful integration into the environment. Some location scenes had to be re-recorded and are obviously lacking, but on the whole the result is very impressive. ����The music of Hitchhiker's has always held a fascination for me, and is very important to the feel of all forms, from the radio series, through to LP and the TV series. Always different through each version, but always with the same sense of playfulness and off-axis charm. Missing from traditional mono TV has been the quality of music and sound effects which were present in the other media - but not anymore. The stereo remix brings back the presence and quality of the music as I always remembered it sounding, and more besides. By contrast, the mono mix is lacking and has noticeably more hiss, though I am pleased with its inclusion for completeness� sake. I was initially put off with the sound of the book (Peter Jones) coming from either the left or right speaker, rather than from the centre, but soon became used to it. ����The remixed stereo track had very minimal surround activity, and consisted of subtle ambience only which was in all likelihood simply a happy artefact of stereo reverb and other phase altering processing. ����The subwoofer will have differing output dependent on your processor's settings. I found it to be used minimally, though many electronic noises benefited from some reinforcement. ����Wonderfully animated menus, though the sound can be jarring. Prepare to be intimate with the main theme music after a while. ����Nicely done scene animations, a little favourite of mine. ����In true �guide� style, you can opt to watch the entire series with a constant stream of tidbits presented as subtitles. There are some real treasures, and I found myself unable to turn it off after a while. Written in a pleasant manner, with a great deal of respect and insight. ����A 1981 TV magazine show excerpt of an interview with producer/director Alan Bell and graphic animation guru Rod Lord. An absolute gem, and a true time-capsule demonstrating the popularity of Hitchhiker�s. Of particular interest is the revelation to many that the superb graphics used throughout the series were not in fact computer generated, but painstakingly hand-drawn, frame by frame. ����A variant of the scene from episode two, with Trillian and Zaphod on the bridge of the Heart Of Gold working out just how improbable picking up two hitchhikers was. ����67 or so various production stills, ending in a recent and somewhat poignant black and white of Douglas Adams, who went before his time. ����Just over nine minutes of various outtakes and bloopers. Watch in awe as otherwise serious British actors gratuitously use a well-known four-letter word time and time again during the attempted screenplays. ����The British equivalent of Towards 2000, which I used to watch religiously as a boy, Tomorrow�s World often showcased current technological developments, and in this case it�s Zaphod�s second head. Why? Because it used several pulley systems and was mounted on a model helicopter rotor assembly, all controlled from a remote radio controller � something quite impressive for a TV show at the time. ����A good chance to put a face to the skilfully inflected voice of the book. At first a novelty, but running at almost eight-and-a-half minutes it does get slightly dull. Essentially, Peter Jones is behind a desk and reading a prepared introduction to the show and his part in it. Slightly amusing at times, and certainly a welcome inclusion. ����A two minute trailer, and collection of BBC 2 programme information on the series. This is golden material, and must have taken some work to dig up. ����Produced in 1992 (along with much of the extras), this is a series of interviews with just about every member of the cast and production. It begins with some footage of the Slartibartday '81' convention in London of the same year, and then progresses to a stream of anecdotes from (to use their character names) Zaphod, Marvin, Trillian, Alan Bell, Arthur Dent, the production designer and Ford Prefect. I was thrilled to learn that Mark Wing-Davey (Zaphod) was every bit the hippy in real life. ����If you ever wondered what goes on behind the scenes of a radio programme (well, as of 24 years ago), all is revealed in this 10:28 over-the-shoulder look at the making of the �Share and Enjoy� segment. Such problems as how to make 2 million robots sing in unison whilst being a perfect 5th out of key from the backing music are tackled with aplomb. Brilliant. ����Now this is truly painful. Over 7:19 minutes we watch as Zaphod, Ford and Trillian attempt what might appear to be a simple scene, but are foiled again and again by bodged lines, bad camera placement, missed dialogue recording and simple retakes due to artistic reasons. It�s quite amusing to see the actors treated almost as props by the production, and see the grimaces on actors' faces as they screw up lines. By the end even I was exhausted, and all over one single scene � really gives you respect for the television production process. ����The meat of the dish, this is an almost hour-long documentary, also produced in 1992. It is typical of its day, using gimmicky computer effects and all the principal actors in character to dress up an otherwise great show. The icing on the cake. ����I am unaware of the specifications of the R1 counterpart, and so cannot make a comparison at this time. The R1 is due for release on the 30th of April. ����The ultimate Hitchhiker�s Guide To The Galaxy showcase, resplendent with a faithful video transfer, impressive audio and enough quality extras to keep avid fans well pleased. My advice � �just do it, would you.� Highly recommended. Display Pioneer SD-T43W1 16:9 RPTV. Calibrated with Ultimate DVD Platinum. This display device is 16x9 capable.